The Collab Blog: "Math Teachers Don't Read!" "Very funny, Ms. Barry. Math teachers don't read!" This was a comment made by one of my students in response to a new campaign at EGHS. At the beginning of second semester, some English teachers decided to start promoting reading in our building by having any staff member post a sign outside their room or office displaying what book he or she is reading. As a reader myself, I was taken aback by this student's comment that math teachers don't read. I understand their logic, however, as I never get the opportunity to have discussions with my students about what they are currently reading. Honestly, I have always been jealous of the other content areas that get to read essays students have written about their lives or create discussions with students picking sides on a topic. Not that I don't build relationships with my students and get to know their personalities and interests outside of the classroom, but I have learned a great deal more about a student when talking with English teachers about some of the powerful essays that a student has written. Therefore, I decided to make it my mission to read all of the books on the summer reading list, prior to our Summer Reading Kick-Off. As mentioned in the blog post, ten minutes of each day in the month of May would be dedicated to reading through Stop, Drop, and Read. 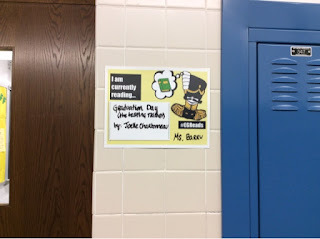 By reading all books on the summer reading list, I could then throughout the class period, I engage in short discussions with my students about the book he or she is reading, it's themes, and how it relates to real life - essentially engaging students in content from another discipline. In my other classes, many students carry the book with them and leave it on their desk, so I can still foster a conversation with them regarding the book they are reading. Not only are these conversations helping to strengthen my understanding of my students, but the books themselves have given me more insight into what our students go through outside of school. The Summer Reading Committee chose a range of books that all center around the theme of Overcoming Obstacles. These books, both fiction and non-fiction, helped me to gain perspective of some issues that our students are working through that I can't personally relate because I haven't experienced them myself. As a math teacher, it is also really cool to see my students in a different light - some love to read and others struggle. I'm so used to focusing on their strengths and weaknesses in our math content, that sometimes I lose perspective of their skills outside of class. I also find it to be a powerful message for students to understand that reading is lifelong skill, regardless of what content you find most interesting. As a teacher in general, however, it has been really awesome to hear students say "Aw man, already?" when the bell rings for the ten minutes of reading to end. Love this Ms. Barry! Working in an elementary library, I have had some great discussions with my kids around the dinner table about different books, they have even helped me make suggestions for the kids at my school. That's great! I think student/child ownership of what they read is really valuable for them to find importance in reading. Why Do We Give Homework?